Over the past 15+ years, a phenomenon has been sweeping across the paranormal community and leaving a good bit of controversy in its path. Orbs have been plauging photographs all over the world. Even though this is one phenomenon that typically gets people interested in ghost hunting to begin with, most people quickly figure out that there has to be a more scientific answer to this all to common phenomenon. Far to many pictures are taken of orbs, just surf the internet for paranormal pictures for 10 minutes and you will be asking yourself... are orbs really spirit energy? Since digital cameras have taken a strong hold on the market leaving film cameras in the dust, more people are taking more pictures without worry of running out of film or the added cost of getting the pictures developed. Just this one fact alone plays a huge roll in the amount of orb pictures hitting the Internet, so what are they and how come your grandparents don't have any pictures of orbs, you would think over the years they would have at least picked up something? In the earlier days of film photography, the cameras available to the consumer market were big, bulky and only had a couple of settings with most having no ability to take flash pictures. Most familys could not afford them, the film speed was extremely slow and the quailty was bareable compared to todays standards. It wasn't till the 1960s that consumer cameras started taking a strong hold with the introdcution of cheaper cameras and consumer friendly film formats. 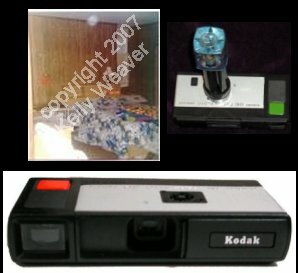 Kodak introduced a camera in 1963 called the Instamatic which used 126 film cartridges and created an ease of use for the general consumers, but the quality was just ok and even though flash cubes were becoming a standard, the brightness of the flash was not really that great and did not cover much distance. The 70s also brought us the first orb photograph. The photo to the right was taken by my good friend Kelly Weaver some time in 1972 in her home in Pennsylvania. The camera was one of the first models of 110 by Kodak using a flash with the flash tower attachement. This is the earliest known photo I was able to find showing the orb phenomenon. Dust is common no matter where you live or how often you dust your house, its almost impossible to create a completely 100% dust free environment even in a clean room at NASA. Dust can be in large clouds not visible to the human eye or just random particles floating about. Due to their microscopic size, dust particles can float for hours in the slightest, un-noticable draft and can actually be attracted towards your camera due to static electrcicity and the type of plastic used to create the camera. Dust is constantly moving in any given direction at any given time and can very easily change direction with the slightest draft. I've spent many hours playing with different types of cameras and checking out the flash ranges, flash angles and just overall performance. I have come up with several theories on how dust is effecting many of the pictures that we take. From a technical point of view, I believe that orbs are 99.9% dust or other microscopic contaminatents which happen to be floating within milimeters of the lens when a flash picture is taken. Since the camera is focusing off in the distance, anything within milimeters of the lens is going to be extremely out of focus, that coupled with the bright flash reflecting back into the camera lens from the particle creates a nice round ball of light. Older cameras were not plagued by this problem due to their larger size and location of the flash, but new smaller cameras which have the flash extremely close to the lens appear to be constantly effected by microscopic particles. 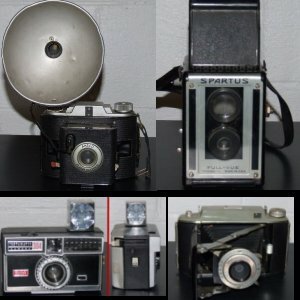 As for our gransparents, back in the day when they were taking pictures and maybe even when our parents were children and lucky enough to have a camera that actually took flash pictures, the flash technology was pretty new and most cameras did not actually have an attached flash. Those that did were large bowl like aluminum protrusions which were designed to throw the light of a large bulb filled with aluminum foil and oxygen. This kind of flash was quite bright but did not have the reflective surfaces in the bowl itself like we use today inside the typical flash assembly. The bulk of the light would be thrown straight out with not much deviation in the angle as it left the bowl. Any dust in front of the lens would not recieve a direct blow from the flash, hence no orb pictures in the 1950s and 60s. 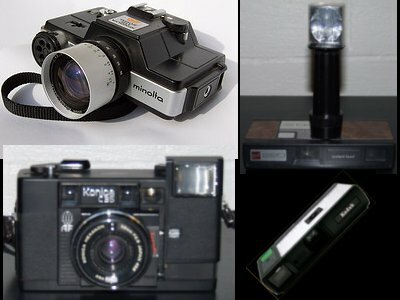 From the late 60s to the early 80s, the Kodak Instamatic 126 camera was the norm along side the 110 camera which appeared in 1972. Both of these cameras used similar flash mechanisms which was a mini version of the large bowl design above packaged in a small cube design which held 4 separate flash units and a much more reflective surface to bounce the flash to the subject, but again the angle is not right for the flash to get within milimeters of the lens so the possability of illuminating dust was very low. 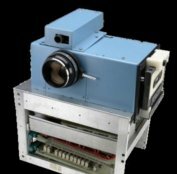 Kodak, Fuji, Ansco and many other camera makers put tons of money into research and development of their cameras over the past 100 years, even though that R&D continues today, we are trading size and convenience over proper design and function. To the right is an average disposable camera. In most cases the flash is located just to the left or right of the lens, some are even directly above the lens. The basic flash design though convenient in its place, is one of the major contenders when picking up so many orbs (dust). 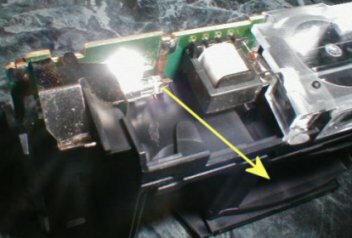 I totally dismantled my disposable camera to check the the angle of the reflectors in the flash. The angle is almost 45 degrees. The small plastic cover over the flash also does some of the reflecting and is convex which may change the angle of the flash to an even greater angle over 45 degrees. As you can see from the animation, dust particles that are close to the lens have the ability to reflect the light from the flash in turn creating orbs on the picture. This animation will also hold true for many instamatic and digital cameras. Basically any camera with the flash just above the lens. To the left is an average mechanical SLR camera. As you can see the flash is situated far above the lens and the design of the flash is to project to the subject. The chance of illuminating dust particles that millimeters from the lens is far less then with an instimatic/disposalbe style camera. Of course there are many different styles of flash available for SLR cameras which will change the angle of the flash and could increase the chance of catching dust. If the camera has the ability to zoom in on the subject, this to can attribute to the orb phenomenon. Orbs are also notorious for showing up in infrared video and even regular video from time to time, but one thing that is constant with these videos is a bright light source just under or beside the lens which can illuminate microsocpic particles just as what happens with a flash picture. Unlike a phtoto still, the orb appears to be moving towards or away from the camera, its an optical illusion based on where the light source is. If a particle is falling from the top to the bottom and the light source is at the bottom of the camera, the particle will appear to be getting bigger due to reflecting more light which will give the illusion as if its getting closer to the camera. The video to the right is a demonstration of this illusion. Most folks investigate at night which makes not using a flash difficult, I have found though that using a slave flash as the main flash can help reduce if not eliminate dust orbs. Slave flashes are typically triggered by the red-eye reduction feature which can be found on most modern cameras. putting a piece of masking tape over the camera flash will filter the light in front of the lens enough as to not illuminate dust but will be bright enough to trigger the slave flash during the picture. So far this is the best solution but may not totally eliminate dust orbs. This is probably the most disputed case for orbs but is also an optical illusion and is based on the light information coming back to the camera. The orb is actually in front of the object, but due to the birghtness of the object, the orb light information is overshadowed by the object so it looks as though the orb is behind the object. Another observation about this phenomenon is that most of the orbs are typically on the left side of the object, this is due to the flash being on the left side when the camera is facing away from the photographer, the flash intensity is much brighter on the left then the right at this point. This can also make them appear to be coming out of walls, doors, etc.. This one is not to common but it does happend from time to time, but what you really need to ask yourself after you get one of these is... was the flash on? Just because its daytime does not mean the flash is not birght enough to illuminate dust in front of the lens. Though the flash is no match for that burning mass in the sky when it comes to throwing extra light during the day, it will be effective to things that are within millimeters of the lens. How come you never see any orbs floating by during evening news? This is what this article is all about... lighting, TV studios are well versed in lighting techniques. The main lights are high above the news anchors and many different light sources are used to remove shadows. The cameras are 5-10 feet away from the set and typically in a darkened area to stop streaks or other light problems from appearing in the lens of the camera. Mobile cameras like on the spot live shots use high powered lights as well, but they are situated at the top of the camera and typically half way back. Particles will get no illumination when right in front of the lens. How come orbs only show up during flash pictures? This is covered above in detail but there is also a big misconception that the camera flash is bleeding into the light spectrum that the naked eye can not see... Though this is true at night the camera flash has no where near the spectrum of the sun, so this being the case, you would think orbs would be visible during the day time when taking non-flash pictures..
How come orbs never show up in studio pictures, they use a flash? This is the same as a TV studio... lighting. A flim studio is setup as such that no shadow will be cast when the picture is taken. In most cases several flashes are used and none of them are any where near the lens of the camera and most are diffused frm being that harsh bright light, there is just no way a dust particle is going to get illuminated in front of the lens. A senastive said... quick take a pic and there was an orb near them, so that must be paranormal! I believe this to be coincidence... 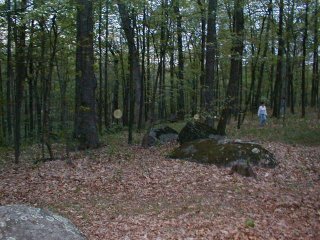 I do believe in psychics and sensatives and work with them constantly during investigations, but just because an orb showed up when they said to take a picture does not make it paranormal. Obviously since dust is everywhere, you have a good chance of picking up orbs at any given time no matter where you are sensative in tow or not, especially if you are in an old building that has not been cleaned in ages. I have plenty of pics where a sensative said the same thing with no results of anything around them and even some where orbs appeared to be right above them or on their hand, etc... But just because a sensative is feeling something does not mean the anomoly is going to show up in a picture or on a video. My EMF meter was going crazy and I took some pictures and got orbs, that makes it paranormal! EMF detectors can be effected by dust believe it or not. Dust can get statically charged just as you yourself do in the winter when you walk acrossed a carpet and touch a door knob. Most EMF detectors are quite sensative and can pick up on the energy being emitted by dust particles in the air. If you want to see this phenomenon yourself, here is a simple experiment. Comb your hair several times with one of those cheap black combs you can find at Wal-Mart for 99 cents. Have someone hide the comb while you are not watching, but make sure its not crushed under anything that could discharge the static, then use your EMF detector to find it. You will find that the EMF detector will start picking it up from a good distance before you get on top of it. I took a picture of an orb, when zoomed in on, it has a face, that makes it paranormal! The mind is constantly working to recognize things that we are familliar with and can sometimes see familliar patterns in a garbled mess. Just like looking to the clouds and seeing the familiar shape of an animal or object floating by, the mind can pick up on familliar shapes and objects on your computer screen. This is called matrixing, we do this everyday without even thinking about it. See the matrixing link to the left for some examples and more information. The orb phenomenon will most likely be a controvesy for some time to come as new folks discover this phenomenon and become interested in the paranormal. Unfortunately this phenomenon is nothing more then particles caught up in the moment. After experimenting with the disposable camera, I decided to dismantel the camera. I was amazed at the amount of holes in the case and the fact that the flash has no real backing behind it. Though the shells have a ridge to stop light from entering the chamber where the film is held, all it would take is some rough handling or bending of the camera case to expose the film to the flash. 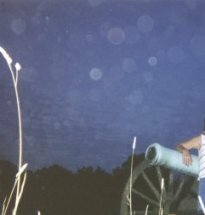 This could cause a streak or white blur on a picture that may be mistaken for a vortex or streaking orb. After this little adventure into disposable camera land, I am now leary of using these cameras for any type of investigation. There are to many possabilities involved.